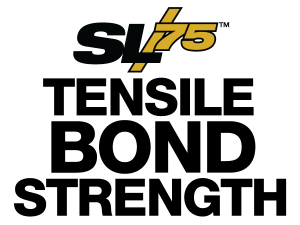 VersaFlex SL/75™ tensile strength, nominally reported under ASTM D412 at 620 psi, develops sufficient strength against cohesive failure (material ripping apart internally) to cause fascial disbondment from the concrete joint (tensile strength of the concrete at the joint fascia, 300-600 psi) when joint expansion stresses develop. We can produce products with higher tensile strength, but would then sacrifice elongation properties in favor of a stiffer material. VersaFlex has found that this trade-off is unacceptable. Should you have any questions, please contact VersaFlex Incorporated.